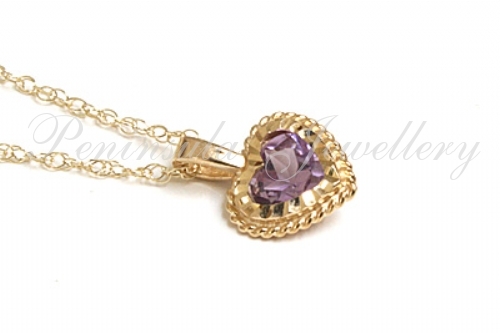 Featuring one 5x5mm heart cut natural Amethyst in a diamond cut 9 carat gold setting. Complete with 9 carat gold 18" Prince of Wales chain. Dimensions: 9mm x 9mm excluding fixed bail. Gemstone weight: .23ct. Made in England. Presented in a luxury gift box - Great Gift! !